at the Library and Museum for the Performing Arts, Lincoln Center, 1977. THE PERFORMING ARTS is a major theme in Roseman's oeuvre. Roseman began an extensive work on the performing arts in 1972 with a gracious invitation from the administration of the Metropolitan Opera, housed in the grand, multi-arched edifice that opens onto Lincoln Center Plaza. At the dress rehearsal of Franco Zeffirelli's production of Verdi's Otello in March 1972, Roseman was seated in the front of the darkened auditorium and drawing by the light coming from the stage. With a lively use of pen and bistre ink, Roseman drew James McCracken as Otello, a role for which the celebrated, dramatic tenor was internationally acclaimed. As Roseman was completing the drawing, someone placed a hand on his shoulder and exclaimed ''Bravo!'' The young artist glanced up and saw standing by his side Franco Zeffirelli himself. After the dress rehearsal and deeply appreciative of Zeffirelli's enthusiasm, Roseman asked him if he would autograph the drawing. Zeffirelli gladly did so and included a personal inscription: ''To Stanley, with admiration.'' Being that the eminent Italian director, an artist himself, had worked with many of the most celebrated performers in plays and operas by the greatest dramatists and composers, Zeffirelli's esteem for Roseman's draughtsmanship was an auspicious beginning to his work on the performing arts. With invitations from leading opera, theatre, and dance companies, Roseman drew at dress rehearsals and performances from the front of the auditorium and from the wings of the stage singers, actors, and dancers in starring roles, as well as supporting players and members of the chorus and the corps de ballet, in a spectrum of memorable cultural events from the exciting world of the performing arts. 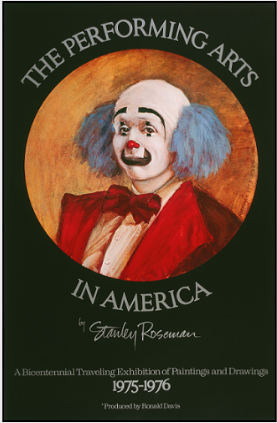 Roseman's work dedicated to the performing arts culminated with the American bicentennial exhibition Stanley Roseman - The Performing Arts in America. The exhibition included drawings from productions at the Metropolitan Opera, New York City Opera, Lyric Opera of Chicago, Greater Miami Opera, San Antonio Opera, London's D'Oyly Carte Opera performing in New York, and Moscow's Bolshoi Opera on the occasion of the company's American premiere in 1975. Dance companies headquartered in New York City, including the American Ballet Theatre; New York City Ballet; Dance Theatre of Harlem; and the Martha Graham Dance Company, which commemorated its 50th Anniversary in 1975, were represented in the exhibition, along with ballet and modern dance companies from abroad. Roseman's work encompassed theatre productions on Broadway and Off-Broadway; at the Kennedy Center for the Performing Arts, Washington, D.C.; and the American Shakespeare Festival, Stratford, Connecticut. Bringing a festive, joyful presence to the exhibition, the celebrated clowns of the Ringling Bros. and Barnum & Bailey Circus appeared in Roseman's paintings, drawings, and "a stunning series of engravings entitled 'Clowns,' '' writes The Times, London. 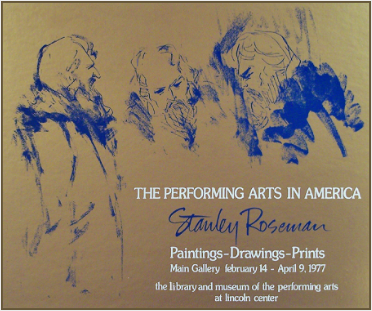 Stanley Roseman - The Performing Arts in America exhibition, produced by Ronald Davis, opened on the eve of the American bicentennial celebrations in December 1975 in the historic city of Philadelphia, where the Declaration of Independence was adopted by the Continental Congress on July 4, 1776. The Curtis Institute of Music, one of the world's leading music conservatories, presented the exhibition in Philadelphia, and thereafter the exhibition toured the United States through 1976. 6. 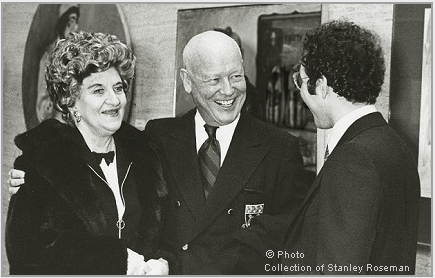 Hermione Gingold (left), Francis Robinson (center), and Stanley Roseman at the opening of The Performing Arts in America exhibition. Francis Robinson, the distinguished Assistant General Manager of the Metropolitan Opera, was a leading figure in theatre management at the Met for thirty years, as well as a noted author and host of the "Live from the Met'' telecasts. Robinson had seen Roseman's work at the outset of his career in New York City in the early 1970's and invited the artist to draw at the Metropolitan Opera. 5. 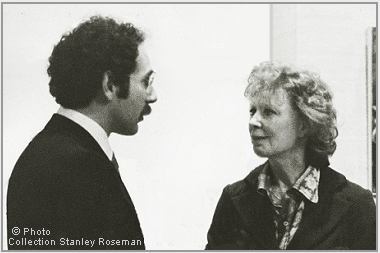 Stanley Roseman and Gwen Verdon at The Performing Arts in America exhibition opening at Lincoln Center,1977. The exhibition included a suite of Roseman's marvelous drawings created at performances of the Broadway musical Chicago, choreographed by Bob Fosse and starring his long-time muse the great musical comedy star Gwen Verdon. The Performing Arts in America exhibition concluded its national tour at the Library and Museum for the Performing Arts, Lincoln Center, New York City, winter-spring, 1977. 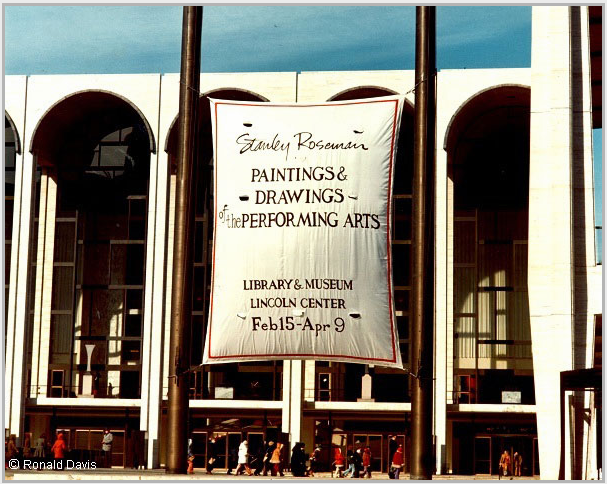 Lincoln Center announced the exhibition with a large banner inscribed "Stanley Roseman - Paintings & Drawings of the Performing Arts,'' - the first time a banner for an art exhibition was displayed in Lincoln Center Plaza, which incorporates the Metropolitan Opera House, New York State Theatre, Philharmonic Hall, and the Library and Museum for the Performing Arts. The Lincoln Center exhibition opened on February 14. The opening on Valentine's Day was especially appropriate for an exhibition that was a tribute to the talented and dedicated performers who have deeply moved, captivated, and delighted countless audiences in theatres, opera houses, and at the circus. The Graphische Sammlung Albertina, Vienna's world-renowned museum of master drawings, conserves the drawing Mikhail Baryshnikov, 1975. With the silvery tones of a graphite pencil, Roseman drew Baryshnikov as Duke Albrecht in the American Ballet Theatre's production of Giselle. The drawing of Baryshnikov is atypical of the frontal position in which dancers are usually depicted in art. Baryshnikov is seen moving upstage in a curvilinear composition focusing on the turn of the dancer's head and outstretched arms beneath voluminous sleeves. 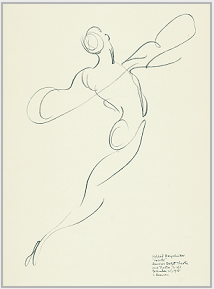 With a minimum of line, Roseman creates a splendid abstraction of the male dancer in flight. 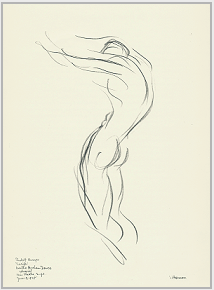 In this dynamic drawing, the flame-like rendering of the dancer's arms, head, and shoulders contrast with the solidity of the arched back, taut stomach, muscular legs, and pelvic thrust. Roseman's drawing vividly expresses the bodily contraction and weightiness that typifies the choreography of Martha Graham, one of the pioneers of modern dance. In the photograph, the celebrated actress Hermione Gingold, famous for her co-starring role in the movie musical Gigi, is being escorted by Francis Robinson to the opening of the Roseman exhibition at the Library and Museum for the Performing Arts, Lincoln Center, on February 14, 1977. In the present work, (fig. 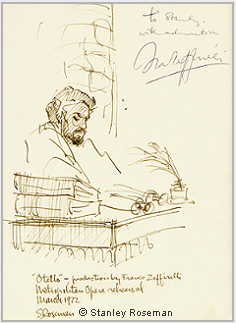 2), Otello is seated at his desk crowded with large, leather volumes, scrolls, and an inkwell from which extends a quill pen. A stone column rises behind his desk. The pyramidal composition leads the viewer's eye up to the Moor's noble head, with strong, facial features and dark hair and beard. Otello's head leans heavily on his chest, and with downcast eyes, he sits absorbed in thought. A great sense of contained emotion is expressed in this impressive drawing. The Performing Arts in America exhibition poster was selected for the 5th International Poster Biennale, National Poster Museum, Warsaw, and acquired for the collection. The great Romantic ballet with its haunting scenario by Théophile Gautier and a memorable score by Adolphe Adam was commissioned by the Paris Opéra and premiered in 1841. At the Opéra in 1991, Roseman once again had the wonderful opportunity to draw at performances of Giselle when the Paris Opéra Ballet celebrated the 150th anniversary of the ballet. The Lincoln Center Library and Museum published a special limited edition, silk screen poster announcing the Roseman exhibition. 4. Poster published by the Library and Museum for the Performing Arts, Lincoln Center, for the exhibition of paintings, drawings, and prints: Stanley Roseman - The Performing Arts in America. Presented here from The Performing Arts in America exhibition are two superb drawings of Mikhail Baryshnikov and Rudolf Nureyev, (figs. 7 and 8), from Roseman's series of drawings at productions of ballet and modern dance. A selection of Roseman's new works from current productions of opera, theatre, and dance and the artist's return to the Ringling Bros. and Barnum & Bailey Circus was added to The Performing Arts in America exhibition during its national tour. The addition of recently created drawings and paintings gave the exhibition an exciting immediacy and was greatly appreciated by the visiting public as well as by the performers themselves, including Richard Burton, who in 1976 took over the leading role of the psychiatrist in the Broadway production of Peter Shaffer's award-winning drama Equus. 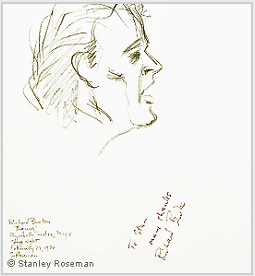 Roseman had been invited in 1975 to draw the stars of the original Broadway cast, Anthony Hopkins and Peter Firth, and drawings of them were currently on exhibition. Richard Burton extended the invitation to Roseman to draw from the wings during performances of Equus. 1. See Stanley Roseman, Stanley Roseman and the Dance - Drawings from the Paris Opéra, (Paris: Ronald Davis, 1996), pp. 9-16.
his working methods, his thoughts on art, and his passion for drawing. 2. Diane Solway, Nureyev: His Life, (London; Weidenfeld & Nicolson, 1998), p. 400. ''Richard Burton invited me to his dressing room and scheduled a day and hour when he said he could view the drawings at his leisure. I prepared a selection of drawings in matte boards for a presentation. "At the scheduled hour I knocked on the star's dressing room door. He greeted me warmly, as always, and said he was looking forward to seeing the work. After I had unwrapped the package of drawings, he placed them around the room and cleared a space on his dressing table. His enthusiasm alleviated my nervousness in making the presentation. What followed was a most memorable experience. "After taking time to look at the work, Richard Burton told me that he would be very pleased to have any of the drawings of himself included in my exhibition. Returning his gaze to a portrait in profile, he gestured with his hands as if putting them around the head of a sculpture and said that he very much liked the sculptural quality of the portrait drawing.